Working as principal contractor, PMJ Masonry were proud to undertake this prestigious Stone Panelling project for residents at Belsize Park, College Crescent, London. Designed by multi-award winning architect, Alfred Munkenbeck, the houses are built to a superior finish and offer exceptional living space. There are six houses on the site which have: five spacious bedrooms (one house has four bedrooms), large open plan kitchen/dining room, reception room, study and utility space. The master suite includes a walk in dressing room and en-suite bathroom. PMJ Masonry was tasked with installing a brand new Stone Panelling Façade System that reflects the area in which the houses are located. 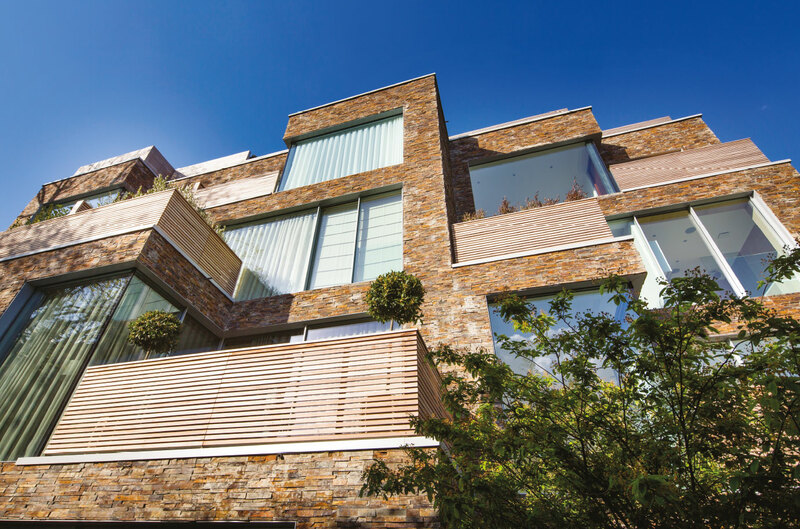 Residents can now enjoy a high specification Façade that not only looks stunning, but is now able to protect the building shell from the worst that the British weather can throw at it!